JBL Control X Wireless review | What Hi-Fi? As any good contortionist will tell you, flexibility is an important quality to have. The same is true, to an extent, of hi-fi. When you’ve got great-sounding audio in the home, you’ll want the flexibility to have the same great sound outside for impromptu parties. That’s the pitch that JBL’s new Control X Wireless are putting forward, anyway. We expected Control X Wireless to be one speaker, but it's a pair in a master-and-slave configuration. Your audio is sent to one speaker, and then wirelessly streamed to the second - as long as it’s within a 30m range. Or, if you have two pairs of Control X Wireless, you can connect the four speakers together so audio sent to one master speaker is then shared to three slaves. And in order to get round the issue of having two master speakers, you can turn one of them into another slave speaker by flicking the toggle on the back. These speakers are pretty resilient, with a sturdy body able to resist scratches and an IPX5 rating for splashproofing. They will be fine in the drizzle or if you spill your drink, but they won’t withstand a heavy shower or dust getting into the port at the back. You’ll be happy to know that they’re not cumbersome - pretty important if you're going to be carting them about. Each speaker weighs just under 3kg. Built into the Control X Wireless is a lithium-ion 2600mAh battery – one for each speaker – powering the 30W of amplification in each channel. Battery life is roughly four hours. This isn’t a particularly impressive time, especially it takes over two hours to get them back to full charge. You might need to plan around finding a power supply if you’re heading out for the day. On the other hand, if you’re thinking about using these speakers exclusively inside, each has a bolt thread on the back so you have the option of mounting them on your wall. They're priced at around £10 per bracket. You’ll have to go through JBL’s Service Centre or distributor to get the mounts, though - they don’t come in the box. You’ll also want to flick a switch on the back from ‘Other’ – which means general use – to ‘Wall’, which optimises the sound for working close to a room boundary. Next to that is another switch for defining which speaker is playing the left or right channels (or both). Helping give these speakers the wireless part of their name is their Bluetooth 2.1 connectivity, which has a range of up to 10 metres. It’s worth noting you can only have one Bluetooth device connected at a time, which is fine for personal use but does mean having multiple people play their music will involve passing a phone or tablet about. Pairing your device to the Control X Wireless is easy: just hold down the Bluetooth button on the top of the master speaker until the LED between the speaker’s 25mm tweeter and 13cm driver flashes blue. There’s also the option to play music via a 3.5mm analogue input. Whether you’re playing via the aux connection or Bluetooth, the Control X Wireless have decent sound – although there’s still a way to go before they’re ready to blow you away. They’re certainly enthusiastic, putting enough volume behind E.L.O.’s Mr Blue Sky to fill our medium-sized testing room. There’s no doubt in our minds that for an outdoor event they’ll be able to be heard by every partygoer. And there’s no element of harshness in their character - they hit the high notes smoothly and support the lofty choir when it comes to the chorus. They're a full-bodied listen, able to be pushed hard without ever becoming grating. But there there isn’t quite enough insight for us to get really excited. The ringing of the cowbell (which is, in fact, someone hitting a fire extinguisher - at least according to the band’s percussionist) doesn’t have the same chirpy shine that we’ve heard on other speakers. That lack of definition is felt in the bottom end too. The drumbeats, the source of momentum and toe-tapping drive throughout the song, come across as too thick and dense to carry much detail. Compared with the Ruark Audio MR1 Mk2 speakers, the Control X Wirelesses only hint at a layered bass sound. The MR1 Mk2s actually deliver it. They don’t time as well as the MR1s either, and it takes a bit of effort to nod along with the rhythm of this bouncy track. We play Jigsaw Falling Into Place by Radiohead, and the Control X Wirelesses dig up enough detail to bring out the vibrations of bass guitar strings and Thom Yorke’s sharp intakes of breath between verses. But they don’t go all the way, falling short of bringing out the sense of emotion, the resignation in Yorke’s quivering vocals. And while the dynamics are solid, we’d like to get more out of them. Playing Old Friends from the soundtrack to The Hobbit: An Unexpected Journey, the JBLs’ sound doesn’t rise and fall as elegantly or naturally as other speakers. The build-up of harmonies before the soaring strings isn't forceful enough, and the rapid transition from bold, dynamic melodies to quiet, quick strokes of the violins needs to be more explicit. 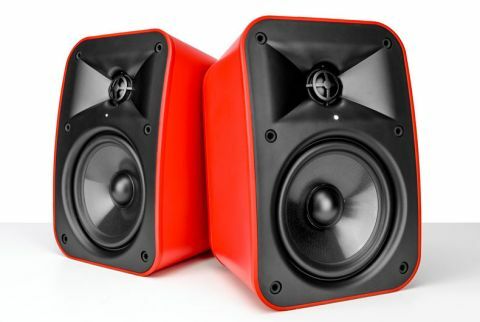 As a cord-cutting update to the static Control X speakers from 2015, these speakers have impressive functionality. Their Bluetooth connectivity, battery and multi-pair functionality are undoubtedly useful features to have. Unfortunately, their sound quality lets them down. They don't deliver the same levels of detail, or dynamism, as their best competitors. If you’ve been looking for something to take outside with you, these speakers will satisfy. But don’t expect them to be the last word in subtlety or insight.